The Oxford dictionary defines cancer as "a disease caused by an uncontrolled division of abnormal cells in a part of the body". This idea is somehow far away from reality. Cancer is not A disease. 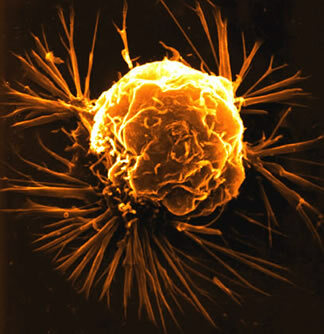 Cancer is the name given to a range of specific illnesses resulting from one of our body's own cells growing out of control. There are many types of cancer and each one has different causes and symptoms, and requires different treatments. When I meet somebody new and I say that I work in a Cancer Research Institute, people ask me if we are about to find the cure for cancer. I have to say no, we are not. And the reason is that THE cure for cancer doesn't exist. On the other hand we have to be very happy because the number of people working on cancer research is really high. They are a big team working together all around the world. And thank to this we know, for instance, that the reason why some treatments work in some patients and not in others with the "same" kind of cancer is that the causes of the cancer in these patients are different. An when I say causes I mean mutations in the genes, in the DNA. Cell division is a highly regulated process in the cells. The cell uses different mechanisms to avoid any errors and be able to divide properly. Therefore, mutations in different genes with a role in different mechanisms of control will lead to uncontrolled dividing cells. These cells will cause cancer, but because of different reasons. If these different mutations take place, for instance, in breast cells they may produce breast cancer. However, because the origin is different, they will probably need different treatments. Actually, nowadays an important part of the applied research is focused on identifying patients' mutations to be able to chose the most effective treatment for each one. There is still a lot to do and research about cancer but, it's a fact that nowadays there are many more people with cancer who get healed than 30 years ago.